ARCATA – It was the first break in an almost week-long heat wave in Arcata. A thick layer of clouds covered the sky, bringing with it the typical Autumn chill of late September. Geronimo Garcia peddled up to the Plaza in his most recent contraption – a wagon three-feet wide covered almost old-school settler style in a greenhouse-warmth-inducing material filled with a sleeping bag, a propane tank for a small cooker, and a few other items. It is his home, his vessel. It is from here in tradition soapbox style that this reporter conducted an “interview” over the next two hours. What was to be a one-on-one interview morphed into part demonstration, part open discussion, focusing primarily on the innovative lifestyle Garcia, and others, live, about the struggles of people without homes, and of what he sees as a system of repression both in Arcata and throughout Humboldt County. Garcia, along with four other candidates and two incumbents, are vying for two contested Arcata Council seats this November. But unlike other contenders in this race, Garcia has a multifaceted objective in his now-second go at the council (he also ran in 2008), much of which is anchored in what he sees as the oppression of a community with the least who, in turn, suffers the most. Garcia arrived in Arcata in 1982 to attend Humboldt State University to study Environmental Science. Almost comically, he described how within the first few days of being here, he earned his first citation from the Arcata Police Department for riding his bicycle at night without a headlamp. Little did he realize the future to come, and how his life here would be one of constant confrontation with police. From his wagon-pulpit, a symbol of his self-resiliency, strive toward innovative and minimalist ways of living, and vehicle of political action, Garcia discusses his creation with curious onlookers. Whether they are other houseless individuals such as himself (though he prefers the term “outdoors”) or more established residents, Garcia eagerly discusses in great breathless detail not only his personal experiences with oppression and suffering, but also his ideas on how to alleviate both. The corner where he parks his wagon is also the location where he registered for his candidacy – H and Eighth street. 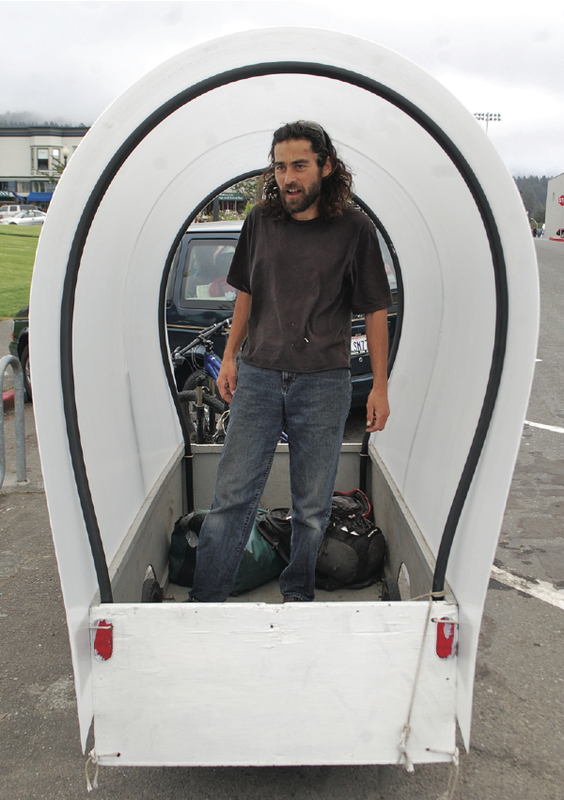 He considers himself a nomad and regularly travels between Arcata and Manila, where he sleeps at times, works on creating a garden at the community center there, and improves upon his wagon. For a long time, he called the Arcata Marsh home, but living in Arcata without a home is tough and comes with constant interaction with police which tends to lead to citation upon citation. “I feel like I’m in exile [in Arcata],” Garcia says of this need to be move back and forth between the two communities. Much of his platform, which is more like his philosophy on life, revolves around mobility and the realization of the basic rights each individual should have: a place to sleep, food on the plate, and a readily available place to go to the bathroom and clean up. Garcia wants to see the old rail tracks converted into a bicycle pathway, where people can freely and safely travel between communities. In fact, after several incidents in which people slipped and injured themselves on the tracks many years ago, he lobbied the city to do something about it, citing liability reasons. This led to portions of the track being paved in the part of town near the Arcata Community Recycling Center. Garcia strongly approves of the planned Arcata Ridge Trail and thinks it should be expanded to include a trail to Eureka. He wants a moratorium on paving for cars and wants the City to instead pave for bicycles. Garcia, like most of the candidates running this time around, wants to see a 24-hour public restroom, and he also wants a place where people can get food no matter what time of day it is. No, not Safeway, we’re talking a soup kitchen here. When it comes to the planned transition housing and emergency shelter plans, Garcia supports it, especially for people who can’t live as independently as himself, but he knows that there will be exclusion and that alternatives need to be available for people who wouldn’t fit with those programs. His model involves a caravan of wagons, in a sense, where people could live and be mobile, almost in Gypsy tradition. He points to the Plaza past 2 a.m. as an example. He questions why people can’t set up camp there for the night, clean up after themselves, and leave at dawn. He also advances the idea of a campground where people could congregate and create community. Garcia’s history with the courts is a long one, a consequence of living an “outdoors” life with a plethora of laws specifically aimed at people living that lifestyle, whether by choice or not. But some of his run-ins with police are not so innocent. When the City planned to construct the Hampton Inn out in Valley West, he was so distraught about a lost opportunity to convert what was a meadow into a community park of sorts that he decided to break the windows of heavy equipment stationed there. He also had a run-in with University Police officers at Humboldt State University that ultimately led to him kicking out the back window of one of the cop cars. In both instances, he is unapologetic, justifying the actions by saying he needed shatter the “glass ceiling” preventing people from seeing the oppression going on in their community. “I broke windows to make a point,” he said. Garcia’s candidacy is part political activism, part running for office. He is far from naïve about his chances of winning, but more than anything else, his goal is to raise awareness about the struggles of those living on the street and of what he sees as the systematic oppression perpetrated by Humboldt County District Attorney Paul Gallegos when it comes to first amendment rights issues and activism in general. It’s a hard life for those living on the streets, Garcia says, where people have to deal with laws aimed toward this community, from anti-camping, loitering, drunk in public, and the controversial panhandling ordinances. APD, he says, arbitrarily executes these ordinances on the houseless community, often leading to a revolving door situation where they are constantly moving through the criminal justice system. Garcia also has no love for District Attorney Paul Gallegos and wants nothing more than for Gallegos to be ousted, naming numerous situations where he dropped the ball or had no respect for people’s First Amendment rights, including an incident in 2006 where a critical mass ride turned into a melee between activists and law enforcement on Highway 101, or when a professor bicycling down that same highway was hit and killed by a driver without penalty. But even with the odds against him, Garcia maintains a strong positivity and optimism, and he says he will continue to run for office until the situation for the houseless is improved. This entry was posted on Friday, October 8th, 2010 at 7:44 am	and is filed under News. You can follow any responses to this entry through the RSS 2.0 feed.